Is that a built-in iSight on a Mac Mini? No. 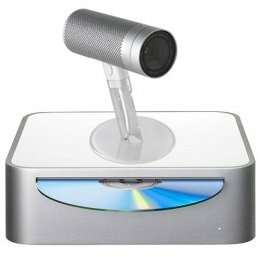 That's Apple's new revolutionary product, the iView - a miniscule LCD projector that looks just like the iSight. The new Mac Mini's built-in iView completely eliminates the need for an external display. All you need is a solid surface, and the iView effectively displays your computer screen for your viewing pleasure. With UXGA (1600x1200) resolution and an ANSI lumens rating of 3000, the iView gives you stunning picture quality and amazing image detail. The built-in iView rests on a sturdy 3-inch stand which allows the lens to swivel at a full 360 degrees and tilt to a maximum angle of 60 degrees. Coupled with the standard zoom-in, zoom-out and autofocus functions, the iView gives you maximum ease and flexibility in adjusting your display. The new Mac Mini with built-in iView now comes with the new Apple Pro Portable Keyboard and Mini Mouse. The new Apple Pro Portable Keyboard is a foldable input device that measures 8 inches in width and 4 inches in length. While the new Apple Mini Mouse has all the features of its predecessor, the Mighty Mouse, at half the size. And with wireless Bluetooth capabilities for both, the new Mac Mini is virtually wire-free. What about the power cord? No problem. The new Mac Mini with buit-in iView also comes with a built-in rechargeable battery pack that gives you up to 5 hours of usage. As long as you have enough power, you don't need to plug into an outlet. This allows you to take advantage of the Mac Mini's size and gives you true portability.